In a recent online article Businesses can’t find people to hire. So why is unemployment still so high for this demographic?, NBC News reported that despite a record 6.7 million open jobs in America and the fact that nearly one-third of small businesses cannot fill open jobs, the stigma against hiring formerly incarcerated people is so severe that more than 27 percent are unemployed, according to a study out on Tuesday from the Prison Policy Initiative. That is higher than the total U.S. unemployment rate during any historical period, and it suggests that many businesses would prefer to leave positions open rather than hiring formerly incarcerated individuals, even though economists have speculated that people with felony records would have an easier time finding a job in this time of low reported rates of national unemployment. Researchers at Northwestern University’s Pritzker School of Law, for instance, studied data on approximately 250,000 applicants for sales and customer service jobs in the U.S., they found that ex-offenders who secured jobs were no more likely to be fired than non-offenders in the same positions. We’re also less likely to quit, making turnover amongst people with criminal records lower than typical employees. Additionally, a LinkedIn Talent blog states that 73.5 million people in the U.S. alone have a criminal record which accounts for one in three working-age adults. The article reports there’s a strong business case for hiring candidates with criminal records. Ex-offenders tend to be engaged and productive, with a strong work ethic. They’re also often extremely loyal to the company that gives them their second chance, staying in the job longer. Unemployment is at its lowest rate since 2000, and overlooking a significant segment of the talent pool makes competitive roles even harder to fill. Remember, we’re talking about one in three U.S. adults. That’s an enormous amount of untapped potential. Many businesses are not aware that there are tax credits available for hiring ex-offenders. If you’ve hired someone who was convicted of a felony or released from prison after a felony conviction during the year before they were hired, you could be eligible. Tax credit for hiring an ex-offender is up to $2,400. The beauty of the Work Opportunity Tax Credit is that there is no limit to how many people you can hire. In our 21+ years of performing WOTC Screening and Administration we’ve saved millions for our customers. 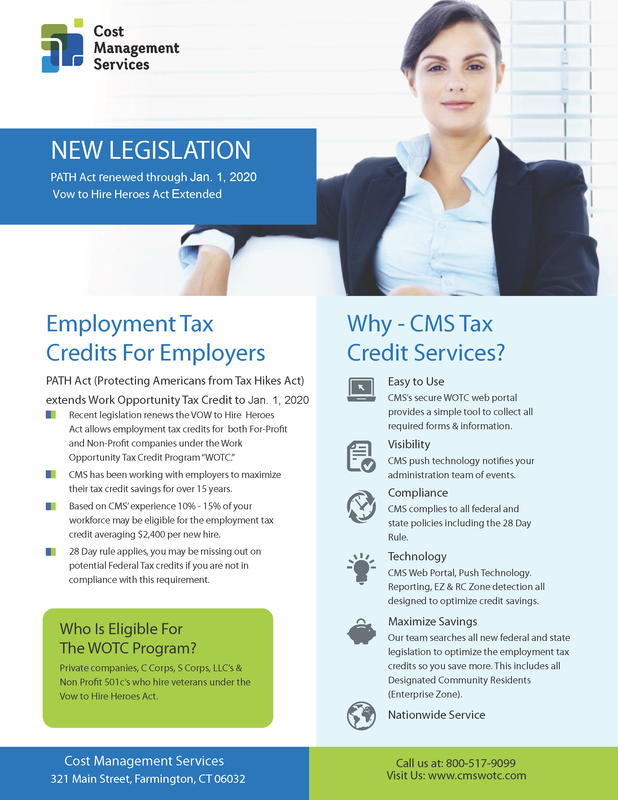 Contact CMS today to start taking advantage. Call 800-517-9099, or click here to use our contact form to ask any questions. Hiring Ex-Felons: Does ‘Felon Friendly’ Pay? This entry was posted in WOTC News and tagged Economy, ex-offenders, Hiring, hiring ex-felons, Hiring Ex-Offenders, Hiring Felons, Work Opportunity Tax Credit, Work Opportunity Tax Credits, WOTC. Bookmark the permalink. ← WOTC Questions: Is There a Spanish Language Form Available?